The 2018 Catholic Charities Appeal has set a goal of $12.5 million for the second consecutive year, Archbishop Charles Chaput announced Thursday, Jan. 18 at St. Katherine Day School in Wynnewood. That figure was topped in last year’s CCA through the gifts of more than 68,000 donors — 7,000 more than the previous year — and through additional fund drives for select charitable beneficiaries. Appeal officials including Board President David Ripsom expressed confidence that the largest annual fundraiser for the Archdiocese of Philadelphia will exceed its goal again this year. The appeal began 60 years ago under Cardinal John F. O’Hara, and since then $290 million has been contributed to the church’s efforts to “feed the hungry, give shelter to the homeless and comfort the afflicted,” Archbishop Chaput said. Solicitation letters for the appeal will be mailed next week to homes throughout the archdiocese and should be received by the last week of January. Donations can be made securely online anytime at the website CatholicCharitiesAppeal.org. The setting for Thursday’s announcement was fitting in that the four archdiocesan schools for special education receive funding from the appeal. St. Katherine Day School educates children with autism, Down syndrome and other intellectual disabilities, and other schools offer a Catholic education to children with visual, hearing and multiple disabilities. Having goals for one’s life should be natural for any teenager, but if you are growing up in a household with drug use and family instability, survival may be goal enough. 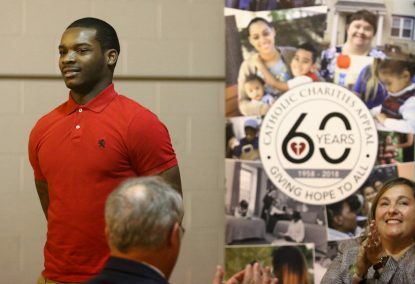 That was true for Montel Johnson, who as a 14-year-old was taken out of his home because of family addiction problems and sent to St. Francis-St. Vincent Homes, a foster care institution of archdiocesan Catholic Social Services. He was the youngest of the 13 residents, mostly aged 16-18, in one of the Bensalem group homes of St. Francis-St. Vincent. He was acting out, getting into minor trouble when older boys and staff “pulled me aside,” he said, and began to talk to him. They became his mentors, offering the support that today he credits as the biggest reason he is on his way to academic and professional success. Johnson is a senior at East Stroudsburg University from which he will graduate this May with a bachelor’s degree in athletic training. After settling into the structured routine at St. Francis-St. Vincent seven years ago, Johnson enrolled at Pennsbury High School in Fairless Hills, Bucks County, and began looking at the world in a new way. No one in his family had ever gone to college, and he believes his siblings aren’t likely to do so. But for the first time a new horizon was opening for him. In Philadelphia schools he had attended, the goal was just to graduate. At Pennsbury the goal was to look beyond high school toward college and a career. “We were asking, ‘what are we going to do in college?’ And we were just sophomores (at the time). The whole dynamic was different,” Johnson said. Johnson’s story highlights just some of the work done by 180 agencies of Catholic Social Services in every community in Southeastern Pennsylvania and among some 200,000 people each year, regardless of economic or ethnic background, or religious creed. In addition to CSS’ services to families, at-risk youth, veterans and the homeless, the schools of special education and community food programs, the appeal supports financially struggling parishes in urban and rural areas of the archdiocese and the needs of clergy. Some proceeds of the appeal also support ministries of the Philadelphia Archdiocese including Newman Centers on secular college campuses, evangelization, life and family programs and communications efforts, including CatholicPhilly.com. Of the more than $12.5 million raised last year for the CCA, archdiocesan officials indicated that $10 million is earmarked for its “traditional beneficiaries,” including Catholic Human Services (of which CSS is an entity) and special education schools. Beyond those beneficiaries, the Catholic Foundation of Greater Philadelphia receives a fee to manage the appeal and reimbursement for expenses it incurs for costs such as mailings. The foundation also runs special “one-off” fundraising campaigns throughout the year such as an appeal for Nutritional Development Services and the Archbishop’s Christmas Benefit for Children, and funds are distributed to those causes directly. Only after all those distributions and expenses are met do the other archdiocesan ministries benefit (see the full list here). From last year’s $12.5 million raised, only $82,952 will benefit those ministries. It will be disbursed later this month with the final CCA distributions for 2017, according to archdiocesan officials. 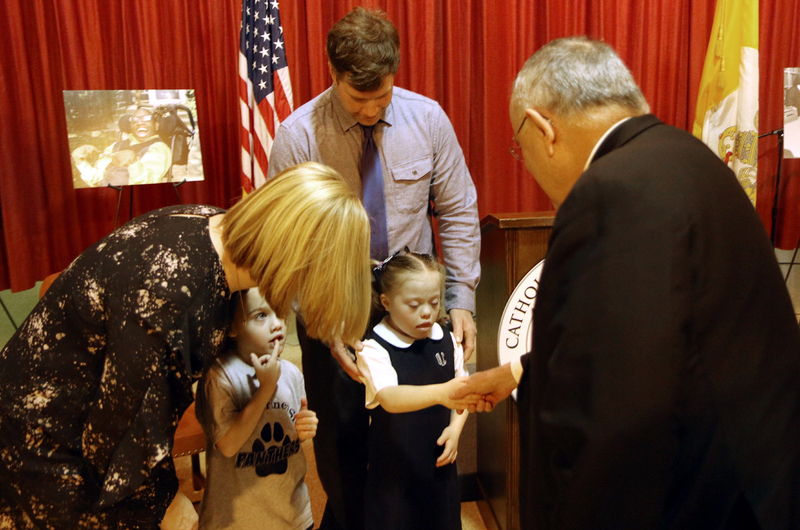 After the press conference Archbishop Chaput greets Ella Nicholl from Our Lady of Confidence along with her parents Chrissy and Kevin and her sister Kennedy.